I was given one of these TVs to have a quick look at and found that there is a common power supply fault. This particular TV was dead, no sound or display and no standby light. Although inspecting the capacitors found no leakage or bulges, the power supply develops a fault and is easy repairable by simply replacing the faulty capacitors. The capacitors can be bought in repair kit form from donberg electronics or even on ebay. I needed the caps the same day so I picked them up from the local maplins. The easiest way to fix is to simply replace all of the caps that can be affected by the fault. I couldn’t get any of the 1000uf 10v at maplins so I substituted these for 16v and the same with the 680uf 25v so I used 1000uf 25v in place. REMEMBER! Electrolytic capacitors have a positive and a negative electrode. (Polarised) This means that it is very important which way round they are connected. Connect them the wrong way and BOOM! This entry was posted in TV Repairs. Bookmark the permalink. I got the same problem with the same tv and moddel which is shown above. Could you just let me know which is the best way to check capacitors if they are working or not? My tv is dead and no lights are on even though tv is new. Thank you. waiting for your reply. Hi usually the best way is to check for physical bulging and leaking of the caps. You can use a cap tester etc or a multimeter, but usually you can see they are bulging. hi there could you help please with my lg tv the same one as above i,ve put 1 new electrolytic capacitor on because the other one was bulging. i changed the fuse in the plug and i still have no power on the tv not even a light do you know why please help. thank you phil. Have you checked the PSU is outputting the correct voltages on the DC side? Usually best to change all the Caps, that will probably fix it to be honest! Dont worry too much about the DC voltages if your not sure. Basically the wires coming off the PSU to the mainboard. Testing a running PSU can be dangerous, so if your not sure, don’t! I would just replace all of the caps, that will fix this psu 90% of the time. If you can’t get a 10v cap a 16v is ok, never use a lower value though. Normally you never need to change the big 300v (or similar value) cap. hi again ya i think i,m gonna have to buy a new board changed all the capacitors part from the big one,s and still no power. thank you very much for your help it was much appreciated phil. 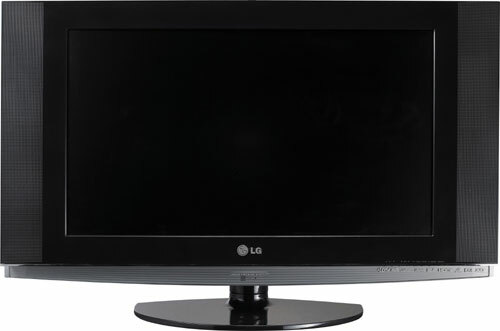 i have had a 32LX2R LG LCD TV for eight years with no problems. My kettle blew which blew all the downstairs sockets and although kitchen problem has been sorted the tv wont work —any suggestions? I would check the caps, if they are goosed the TV may well work fine until it is unplugged or power is disconnected from the PSU As it is a switch mode power supply it may work fine even when faulty until power is removed. Hi, just wondering if I could get away with using a 25v 2200uf cap, as opposed to the original and stated 10v cap? Hi Bob, as long as the voltage is above and reasonably close it will be fine. Never fit a lower voltage cap. Hi, change the Caps. They cost very little and you’ve got nothing to lose! Sounds like a cap fault to me. Where is the fuse on power supply sitting. Can´t find it on my LG 32LX2R? The main AC fuse? It’s in the usual place next to the power socket, wrapped in shrink tube if I remember correctly. Don´t know which is the usual place. Not on the power supply then? Do I have to solder that component away or does it have a socket? Yes its a soldered fuse, directly in line with the mains input. Looks like a normal plug fuse (kind of) but with legs soldered on either end and covered in a form of insulation. Just unplug the set and test with a multi-meter for continuity. Probably a bad Power supply. Stuck in standby, check the capacitors. Rightio, have bought capacitors and a 30w solder iron. Got first capacitor off but it’s left prongs in the holes. What can I do now? The solder iron doesn’t seem to be heating the prongs enough even tho when we test it on solder the solder heats in a split second. Help please? Hi Alex, sorry about the late reply. On the underside of the board, apply solder to both pins. Heat the solder whilst gently pulling the cap away from the board. The flux in the solder will make the cap loosen. Gently rock the cap from leg to leg whilst applying heat. GENTLY! If you pull too hard the board will become damaged. The holes that the component legs go through contain a metal rivet that will pull out with the legs if your not careful. If this comes out, the board can sometimes be difficult to repair. After removing the component, use some solder mop to remove any left over solder. If the solder wont budge from within the hole – I cheat and use a hobby drill with a tiny drill bit and drill the excess solder out. This works perfectly but you must use a tiny drill bit, you don’t want to drill the via out. It sounds like you have left the legs in the board, not an ideal situation. You can solder a replacement cap directly to the prongs and leave them in situ. Remember your working with a mains power supply here, please be careful. If your not sure take the board to a local repair shop, with the caps. It shouldn’t cost much at all. Hi, Thanks for the useful posting. I changed the 14 power supply electrolytic capacitors this afternoon and my LG 32LX2R is now working perfectly. Excellent, really glad to hear it you fixed it – well done! Hello, nice post, I’ve got a fairly used lg 37lb1r here that not too many days ago gave of a pretty loud pang and since then will not power on. no standby light no nothing. it’s dead. Opened the pannel founed 2 capacitors blown. Could this be the reason for it? 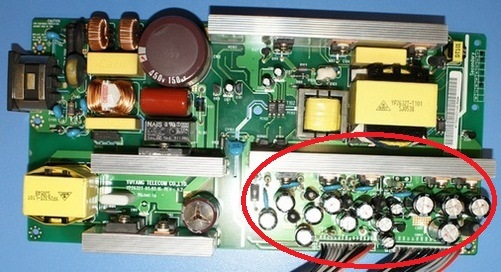 thats the same powerboard, the two blown capacitors are located in the lower right corner. capacitors 5 and 6 from the right. Both are bulging. replacement is possible both are 1000uf 10v but being new to this I am wondering if complete shutdown could be the result of two such blown capacitors or if there could be more problems? Yes of course could be, a loud bang will be the PSU for sure. I would replace the caps first and the soldered fuse could well have popped, if not sure look for a replacement PSU. Do you know what the issue could be if the capacitors are perfectly fine but just getting the standby light still. there are loads of things that could be causing your fault. If you have access to a multimeter, I would carefully check the output voltages from the PSU. Hi, it is usually recoverable – how did you damage the board? If the board is arcing then you can usually drill through and patch using mod wire, or again drill and shrink tube the capacitor leg and attach to a point in the trace further along. It is hard to say without seeing the damage.